Only a few years after the Pilgrims settled the Bay Colony, the Rev. Henry Whitfield and his followers left London to establish new lives in Connecticut. Listed as a passenger on the St. John when it set sail May 20, 1639, under the command of Capt. Richard Russell, was "John Parmelin," the Parmelee family's 55-year-old patriarch, who was on his way to join his son, John Jr., who had sailed to America four years before aboard the Elizabeth and Ann. Before that first ship of the three-vessel Whitfield fleet arrived at New Haven in early July, the men aboard pledged their lives and futures toward the good of the entire party by signing the Plantation Covenant. John Sr.'s name -- though not his signature -- appears on a copy of the document dated June 1, 1639. The deed remained in the hands of the planters until they formed a church and decided how to divide the land. The planters laid out their home lots, parceling out land long ago cleared by Native Americans for their cornfields. Allotments were made in accordance with wealth: Every 100 pounds of their estate brought the family 5 acres of upland and 6 of salt meadow. No family was allowed more than 500 pounds' equivalence nor less than 50 pounds'. After additional purchases were made in 1641, '45, '63 and '86, the settlement comprised more than 53,000 acres, including East Guilford [now Madison]. Like many early settlers, the Guilford planters set about recreating a life they had left in England on these heavily wooded peninsular necks of Long Island Sound. 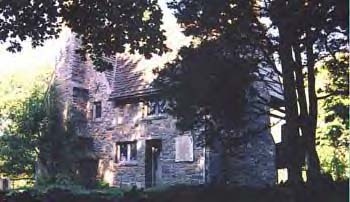 Whitfield's stone house, right, built that first autumn with the help of paid Indian labor, is one of the oldest dwelling houses standing in the United States today. It was the scene of the first worship services and used as the townspeople's protection from hostile Native Americans and other European settlers. The original settlement numbered about 40 homes, with most of the settlers making do those first years with tents, wigwams or roofed-over cellar holes while their houses were being built.On June 19, 1643, the planters established their government: "The Seven Pillars," seven members of the church who acted as a legislature and court and held the town lands in trust for the inhabitants. On July 6, 1643, court records simply state that "Manunkatuck named Guilforde." That same month Guilford became part of the New Haven Colony, an accord that benefited them both: Guilford had sought protection from the Native Americans, Dutch and Swedes; New Haven was anxious to seem larger and more important in the eyes of the Bay Colony to the north. 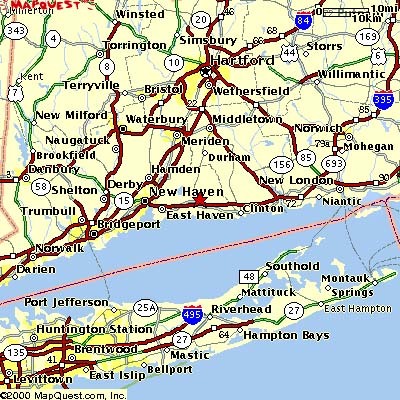 The towns of Guilford, Milford and New Haven had a combined population of 132 when they formed New Haven Colony. The 1990 U.S. Census pegged Guilford's population at 19,848 -- much of that growth coming in the past 50 years. In 1730, the town had 1,630 inhabitants. That figure had not even doubled by the close of the Civil War, when the population reached 2,275 in 1870. Nearly a century after that -- 1958 -- the headcount had reached just 6,400. Nearly four centuries have passed and still you can find Parmelees in Guilford! Take a walk around town and see some of the houses that our family has called home. The Plantation Covenant: John Sr.'s name appears on this 1639 pact which was signed by the town's Founding Fathers. Home lot map: Find the family's first parcels on a copy of the town's original property map. Oldest tombstones: Brothers John (1639-1725) of Guilford and Joel (1679/80-1748) of nearby Durham. Oldest portrait: Town Clerk Ebenezer (1738-1809). Oldest family home: The Hyland House (1690) at 84 Boston St., now a museum. The Village Green: "The Largest Town Green," from a 1989 article in Yankee magazine. The Henry Whitfield Museum: Take a virtual tour of the state's oldest house (1639). And see its exhibit of Ebenezer's clock. Chamber of Commerce: The latest happenings in town. 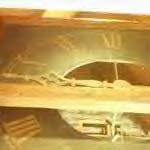 Ebenezer's (1690-1777) timepiece, built in the 1720s, is at the Whitfield Museum.